Sunita Narain is a renowned environmentalist and a political activist, whose aim is to promote sustainable development in India. She is currently the director of the Centre for Science and Environment, based in New Delhi, and the director of the Society for Environmental Communications. In addition, she is the publisher of a magazine called Down To Earth, which throws light on environmental threats facing India and the world. Sunita Narain was born in New Delhi to Raj and Usha Narain, and is the eldest of four sisters. Her father was a freedom fighter who established a handicrafts export business after India’s independence. However, he passed away when Sunita was eight. As such, Sunita’s mother was forced to take over the reins of the business and support the family. Since Sunita was the eldest among her sisters, she took her family responsibilities seriously from a young age. She was focused on her studies and determined to make it big in life. While doing her graduation from Delhi University from 1980 to 1983, Sunita Narain started working in the field of environment and was excited by the challenges present in the field. In the 1980s, Sunita Narain met Kartikeya Sarabhai, son of renowned scientist Vikram Sarabhai, who offered her a position as a research assistant at Vikram Sarabhai Institute for Development and Research in Ahmedabad and from then, there was no turning back for Sunita. She enjoyed her work in the field of environment and decided to make it a lifelong career. Sunita Narain is involved in projects aimed at reducing air, land, and water pollution, wildlife conservation, and sustainable usage of natural resources. Over the years, Sunita and her team at the Centre for Science and Environment have implemented rainwater harvesting systems in a number of villages across India. And through rigorous research and successful applications, Sunita and her team changed the paradigm of water management in India. With regard to wildlife conservation, Sunita managed to put pressure on the government to pass a Bill to set up an authority and overseeing organisation for tiger conservation because the number of tigers in India is dwindling at an alarming rate. 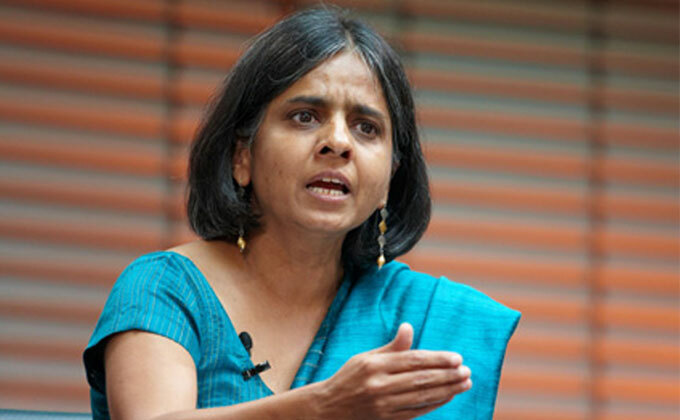 Sunita Narain has a number of publications under her name: Towards Green Villages, Global Warming in an Unequal World: A case of environmental colonialism, and Green Politics: Global Environmental Negotiations, to name a few. For her significant contribution to the field of environment and its sustainable development, Sunita Narain was awarded Padma Shri by the government of India in 2005 and honorary Doctor of Science by the University of Calcutta in 2009. We have a lot to learn from Sunita Narain. Although sustainable development was not widespread in India in the 1980s, Sunita took up the challenge to create awareness in the Indian society and enhance the lives of Indians for the better. We should not be afraid of taking up new challenges or treading a new path. Success comes to those who will and dare and Sunita Narain is definitely a person who has determination to make radical changes to the current condition of the Indian environment, and has reaped success in all her attempts so far.